Bright Corporate Law has advised Queensland Professional Credit Union Ltd (trading as YCU – Your Credit Union (“YCU”)) on the acquisition by Auswide Bank Ltd of all of the shares in YCU by way of a scheme of arrangement and a demutualisation. Auswide Bank is listed on the Australian Stock Exchange. The parties entered into a Merger Implementation Agreement in December 2015. The scheme was overwhelmingly approved by YCU members on 18 April 2016 and implemented on 19 May 2016. Eligible YCU member shareholders each received $4,055 in cash and 696 new Auswide Bank shares in consideration for their $10 share. 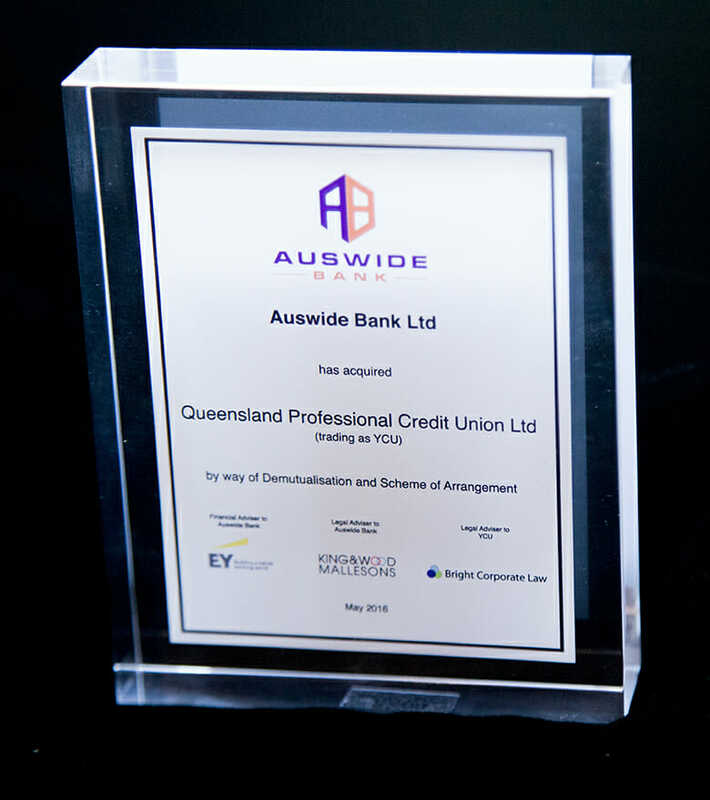 The Auswide Bank shares traded for $5.15 each when the scheme was approved by the Supreme Court of Queensland on 3 May. The scheme released substantial value for the 4090 YCU members: an independent expert found the scheme was fair and reasonable and in the interests of YCU shareholders as a whole in the absence of any superior proposal. The transaction involved complex financial services and corporations legal and regulatory issues. It was the first merger between a listed bank and a mutual ADI in over 10 years. “David and I worked together as part of a 6 month financial Institution merger project which was completed successfully. David was available when needed and provided prompt, accurate and quality advice. He anticipated the major issues and provided practical and commercial solutions.